I know, you have 'Exercise More' on your goal list for 2016. Two years ago that was on my list too. Guess what...this one was a success! I posted a little bit about it back in January 2014 when my girlfriend and I began Zumba classes at our community center here in town. We are still at it and having the best time. cheerleaders but it's so much fun. Music, dancing, and laughing with friends. What more could you want from sweating? If exercising is on your list of wonderful things to do in 2016, visit Zumba. 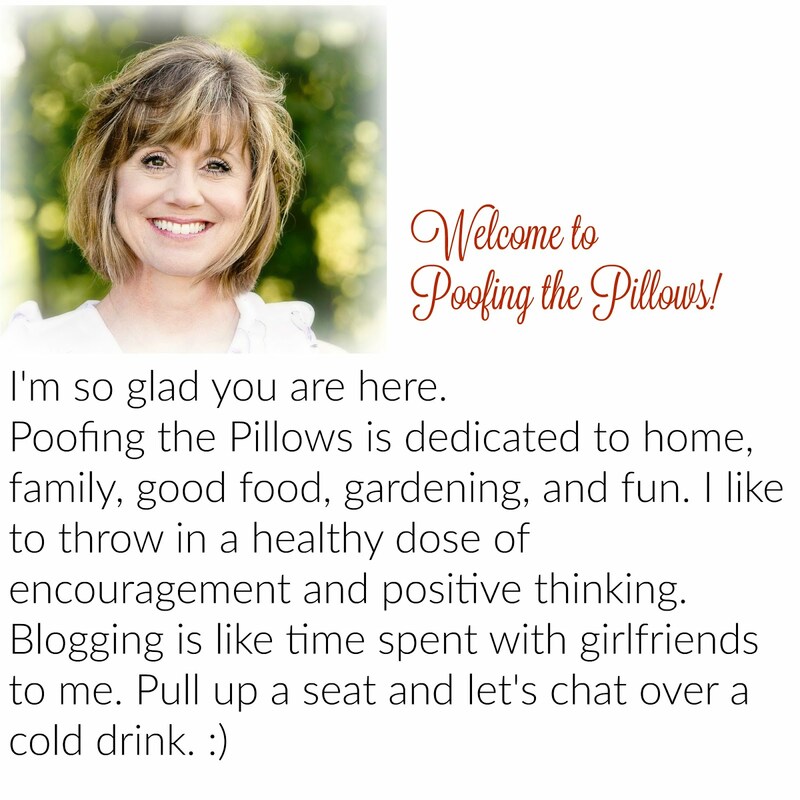 Check out the Poofing the Pillows Facebook page to see a video of my teacher Chely in action. I'd love for you to follow me there. 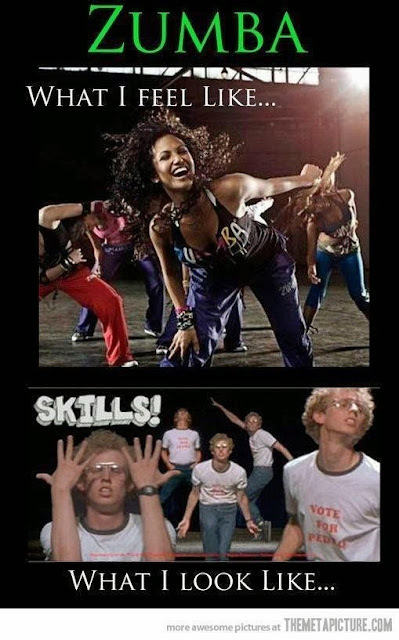 Now if you are thinking about Zumba don't be intimidated. Have fun with your goals and you are more likely to stick to them! I bet you love Zumba! I know a lot of people who really enjoy it! I love that clip of Lucy! I am a walker and tennis player... that is my form of exercise. I would swim too if I had a pool. I think Zumba would be fun for me, but the classes at my tennis club are not at good times for me and I'm too cheap to pay money when we already spend a lot of money for the club. Maybe I should put on some music and do my own thing! Make sure to check out my blog after 3 p.m. PST. I picked the features for this week's Share Your Cup and yours is one of them. I love your sign with the lyrics of What A Wonderful. That's the song my son and I danced to at his wedding. I took your idea and made an iron on transfer for a tea towel. And, I want to do it on a pillow, but haven't gotten around to it. I haven't tried zumba, I have a bad knee and I'm kind of scared I'll hurt myself twisting. I dislocated my patella years ago and I'm mentally scarred forever... Hurt worse than childbirth. My neighbor and I were walking everyday but she fractured her foot...I'm so bad at exercising alone. I need to do it anyway! It's all about elliptical for me and my defective feet. I envy you... Zumba looks like a fun way to work out. Someone I know lost so much weight taking Zumba classes over a few months, that I did not recognize her until she spoke to me! Yup, need to get on that!! LOL Thanks for stopping by and commenting on our organized pantry. How fun. Good for you. I'd love to try it sometime. Ha Ha, you know us well, Stacey. For the first year in a long time I can truthfully say I am sticking with my exercise plan. I commend you on being so faithful to Zumba. How great to enjoy it with a friend too. I've heard a lot of people say they enjoy it. I'll have to check it out. I have tried Zumba but then settled on Jazzercise. I love the music at Jazzercise - keeps me up on the latest hits. Zumba....I've been considering giving it a go, but haven't found a class here in the new area. My DIL teaches a class and my granddaughter goes to a kids Zumba class. I remember when you first posted about your Zumba classes. It's sounds like so much fun. I had high hopes of returning to the gym a few weeks ago and the asthma kicked in. No rhyme or reason. Now it's passed and I want to ease into walking then running the track...then look at the classes. Zumba is one! Thanks of the funny videos! lose weight and get into a healthier state. Your post is encouraging. Turning your attention to dance, and away from the daily grind, is a great way to relieve stress. Studies show that exercise is very effective at reducing fatigue, improving alertness and concentration, and enhancing overall cognitive function. In Zumba, your arms and legs are generally moving in different directions so it requires a good deal of coordination. Repeated practice improves coordination and helps you feel more comfortable moving your body. Every time you exercise, you release endorphins, which trigger positive feelings throughout the body.